Chex mix is a classic holiday snack that has been around for years. There are many different versions of it, but I prefer the sweet versions like muddy buddies, lemon buddies, snow buddies, and today’s cinnamon sugar chex mix. What I love about chex mix is that it makes the perfect gift to give away. 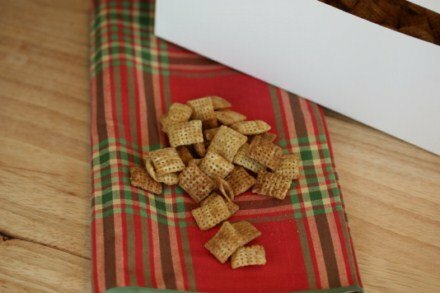 You can easily make up a few different kinds of chex mixes and place them in a nice gift bag or box to give away. 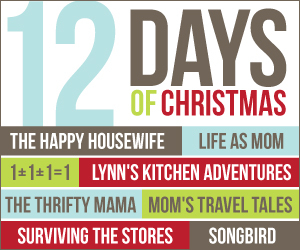 A simple and easy gift that anyone would enjoy! In a small bowl mix brown sugar and cinnamon. Set aside. Stir vanilla into melted butter. In a large bowl combine cereals. Pour butter and cinnamon sugar mixture over the cereal until evenly combined. Microwave entire mixture for 3-4 minutes or utnil it just starts to brown. Stir once while cooking. Spread on a cookie sheet to cool and then store in an airtight container or bag. Yummy! The only Chex that my dd can have is the corn and the rice. Do you think it would work if I doubled the cinnamon? Yes, I think you could add extra cinnamon and it would work. It would have a little different flavor, but I think it would still be fine. This is so good! I made a dairy-free version of your recipe and put it on my blog. (http://www.mspimama.com/2011/12/cinnamon-sugar-chex-mix.html) Thanks for another great recipe! This looks so good! I want to make this for my daughter’s Brownie troop. I know the Rice Chex and the Cinnamon Chex are gluten free. Is this recipe considered to be gluten free? Thanks! Yes the rest of the ingredients should be gluten free as well. I have never seen any gluten in cinnamon, but you might want to just read the label on the one you are using to be sure. I am glad everyone enjoy it! how many servings is this supposed to make? I would say 6-8 depending on what you are using it for. If I am making it for a large group or for gifts I double it. Do you know the serving size and calories per serving?